The importance of reading spaces – and a giveaway! We’re excited to have a guest post from our friends at Big Game Hunters today – and a very exciting giveaway! Read on to find out why they think cosy reading spaces are so important for children, and how you can win one of their beautiful wigwams. We’re so pleased to be teaming up with the lovely Scholastic in our joint passion for little ones’ education. At Big Game Hunters, we love playing our part in helping little ones to learn. It’s magical to see children grow their confidence, build skill sets and develop abilities, so we’re really proud to have lots of activities and resources to support this growth. We love being a trusted place for families and teachers to visit and find play equipment for their home and school, with lots being perfect for both – and that’s why we’re really proud of our teepee wigwams. Wigwam teepees are perfect for setting up at home or in school and provide a lovely space for lots of learning to take place. A teepee becomes an exciting reading den, providing a comfortable space for children to read books and explore their imaginations. Having their very own little space opens up a world of imagination where they can fully immerse themselves in new stories and adventures. We love how teepee wigwams help to encourage quiet time and a space to enjoy independent reading and storytelling with friends and siblings. Children can truly absorb themselves in stories in the comfort of the cotton den while developing their ability to read and enhance their imagination. Sharing the teepee with friends and siblings inspires little ones to read stories to each other and develop their listening skills as well as reading skills, in a relaxed space that inspires quiet and concentration. While children are developing confidence in their reading skills, having a space that feels familiar and comfortable can really help with literacy skill building. Practicing to read out loud independently or with friends, siblings and parents can feel a little daunting until confidence grows and reading skills develop, and a familiar space that little ones can nestle in and enjoy time and time again helps to support this. When the little ones are having a little break from reading, teepees are also perfect for inspiring creative and imaginative play, providing lots of scope for a variety of adventures as well as room to host tea parties! 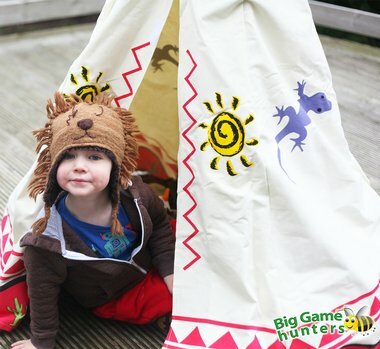 The Big Game Hunters teepee wigwams are made with 100% natural cotton and feature a water-resistant surface. They assemble in minutes, so you won’t be wrestling with them for hours, either. To win, simply head over to our Facebook page and like this post to enter! 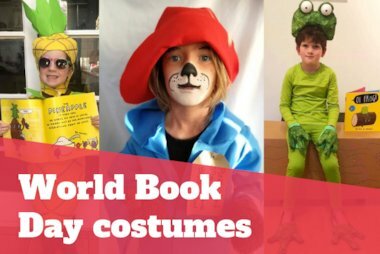 And, if you need some reading inspiration, take a look at our range of stories celebrating every kind of adventure – from under the sea to outer space! If you’d like to browse Big Game Hunters school play equipment and activities, you can visit them here. 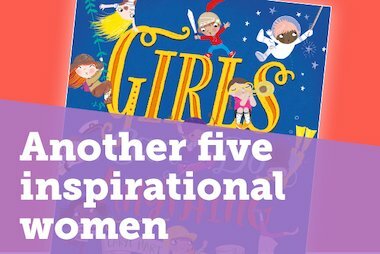 Award-winning author Caryl Hart discusses the lives and achievements of five more women who have inspired her.